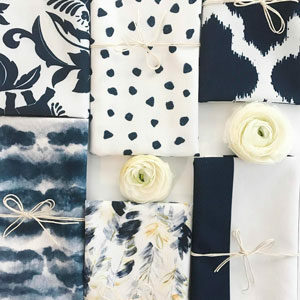 As you can probably tell from the previous items included in Fair Ivy surprise boxes, I’m a big fan of handmade table linens. 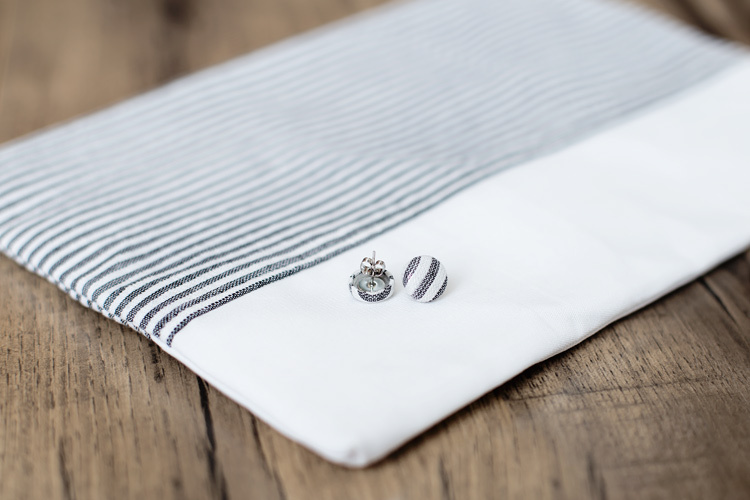 One of my past favorites was this June & December herb tea towel set. Although Fair Ivy is currently on hiatus (because we’re brewing up some great things), I’m still always on the hunt for new products that might be a good fit for a Fair Ivy box in the future. I like to say I’m writing up a little “wish list” for the coming months/years. And it was during one of those hunts that I came across the gorgeous handmade table linens from Wolf & Irving. Normally, I’m used to finding new handmade items on Etsy, so when I come across something out in the “wild” of the internet, it’s a pretty exciting experience. The website is airy, bright and cheerful—it’ll quickly draw you in. With a little scroll through their Collections, you’ll see that the range of styles are sure to hold something for everyone. 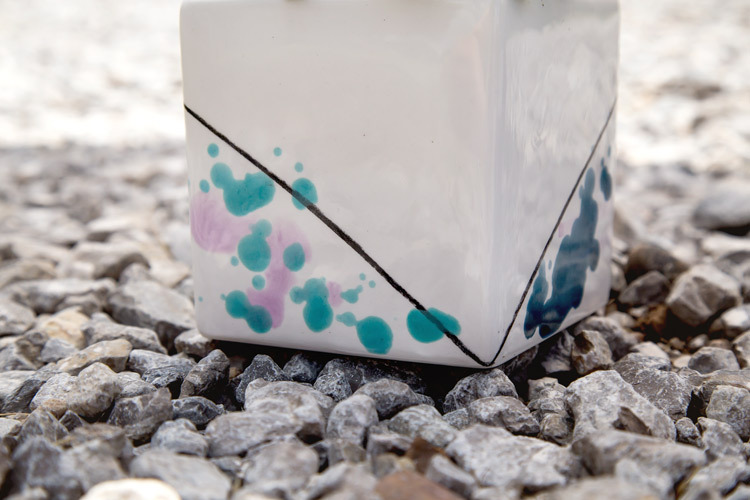 Whether it’s polka dots to watercolor, the designs all feel like something straight out of Sunset Magazine. . All of them would make great wedding gifts, and would even work well as birthday gifts for women (or fancy gentleman) of all ages. I could see myself giving a set just as easily to my grandmother as I would to my best friend, which is a pretty unique ability (and consequently one which Fair Ivy strives to achieve as well). An added bonus is that each piece is eco-friendly, printed on fabric made from repurposed materials, and is hand-cut and hand-sewn (yay!). Needless to say, Wolf & Irving is definitely on my wish list now. Visit WolfandIrving.com to check them out. The October artist of the month hails from the Seattle area and has designed a lovely set for our Fair Ivy subscribers. Simple details with a bit of hammering and a bezel setting, this crystal bracelet and ring is modern, classy and full of warmth and light. Can’t wait to find out more about this month’s gift box? Scroll down to check out all the details and find out more about the artist of the month. 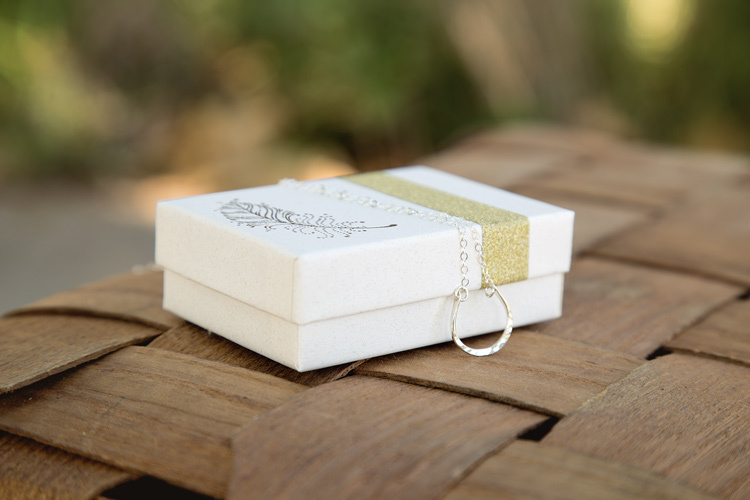 Each gift box has two items designed and made by Natalie at Modest Elements Jewelry . 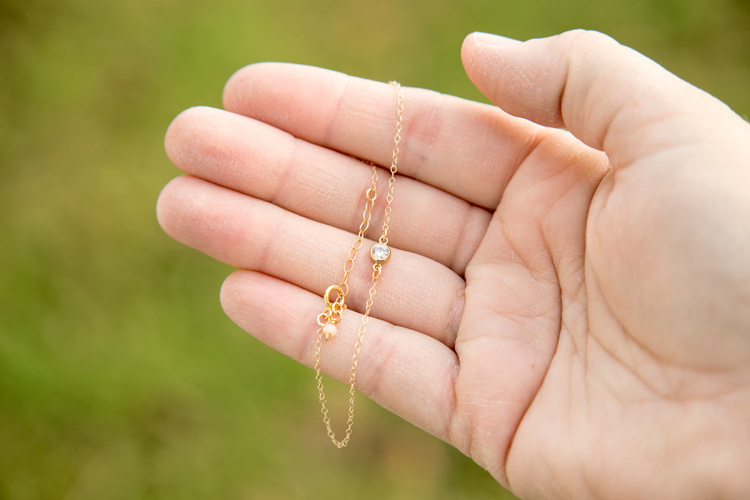 Both pieces are crafted from 14k gold fill and are lightweight pieces that embrace minimalist lines- simple, easy to wear alone and they play well with others too. Much of Natalie’s work incorporates natural materials such as stones and crystals and you’ll also find layered necklaces, geometric shapes and daintily linked chains. The ring in this month’s surprise package has been hand forged and lightly hammered on the ends to add texture and detail. 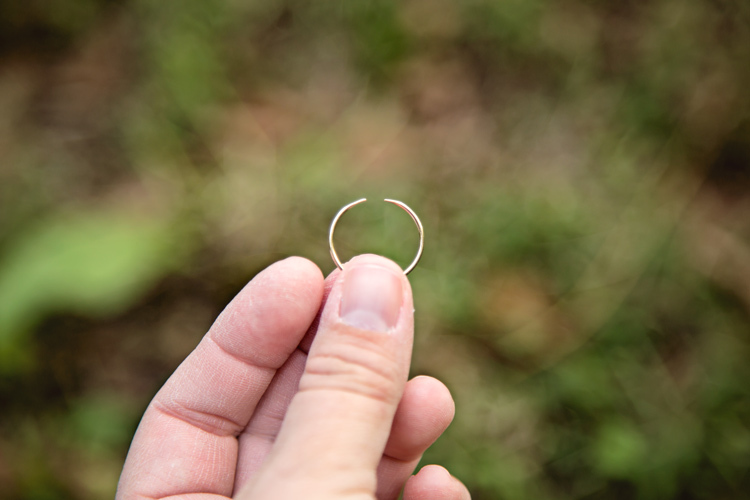 Each ring is open ended to allow for a cozy fit that isn’t too snug. The thin gold band can be stacked with other rings to make a bolder statement or worn by itself for just a bit of shine. 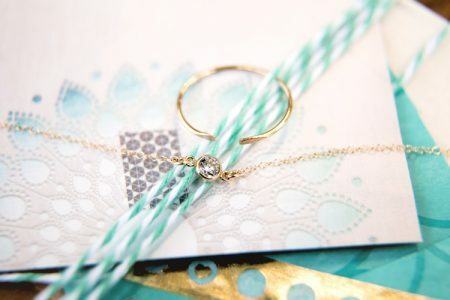 Along with the hammered ring, October’s subscribers received a delicate crystal bracelet, handmade from gold fill chain and set with a spring clasp. The chain bracelet has an understated elegance and is an easy to wear piece that is perfect for everyday use. With an extra long tail, this gold bracelet is a breeze to clasp and lets you find the perfect length for a comfy fit. If you’d like to see more offerings from Natalie, check out her Etsy shop and be sure to follow her Instagram feed for updates on the latest pieces she’s created. 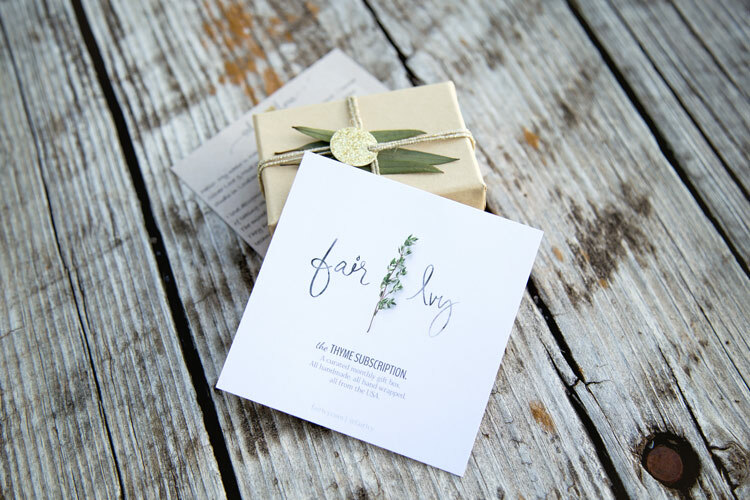 For our Fair Ivy subscribers, a special discount code has been included in each package. With August upon us and monthly surprises on their way, our Thyme subscribers will have their weekend look all zipped up. 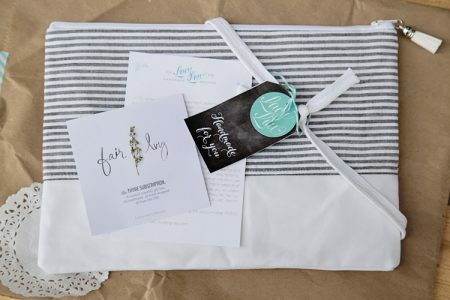 Lacy Lou Designs is the Thyme artist of the month and she has designed a fabulous zippered clutch purse exclusively for our Fair Ivy subscribers. Scroll on down to see all the details this fabric clutch and the sweet little surprise that is hidden inside. Coming to you from northern Utah, the surprise for this month is a sleek clutch that is the perfect size for holding everything you need and versatile enough to go with you on morning errands and out with friends. 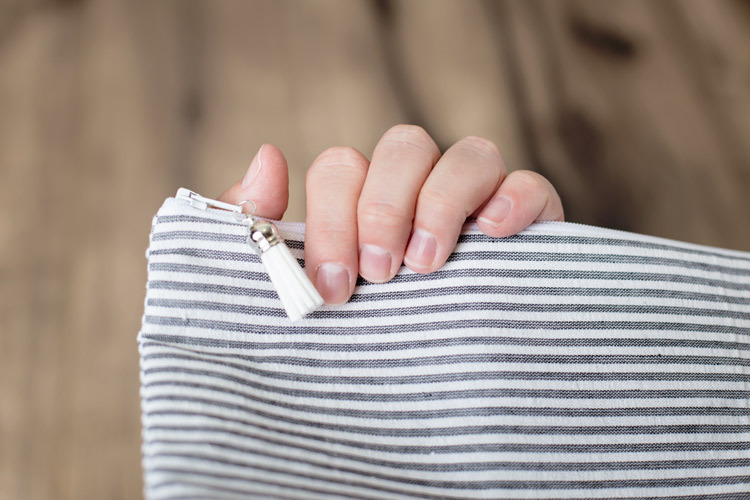 The zippered closure keeps the contents of this clutch purse neatly tucked away and it is finished with a silver and white tassel. 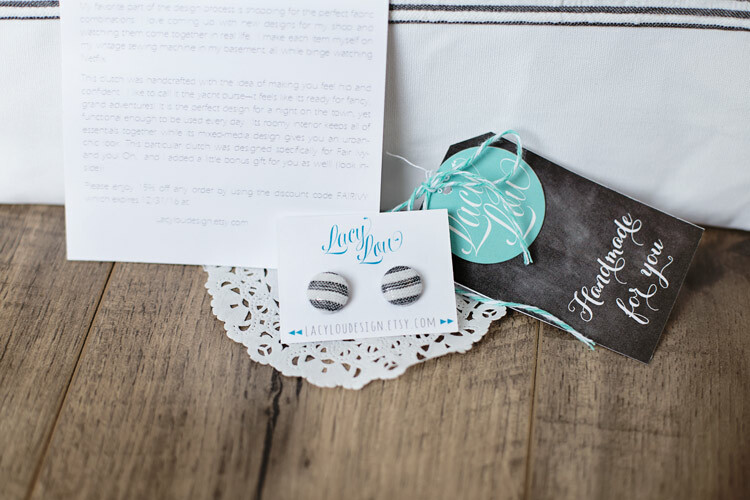 Lacy, from Lacy Lou Designs, describes herself as a busy mom and self diagnosed fabric addict. Her items are all handmade and she offers purses, key chains, wallets and other items in her Etsy shop, Lacy Lou Designs. 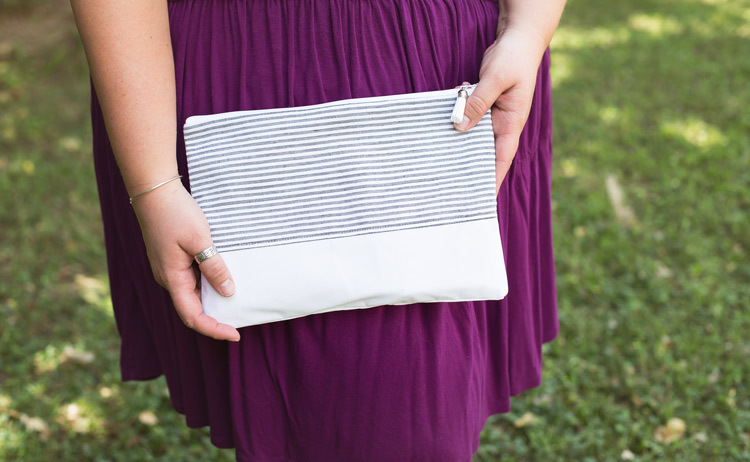 The clutch purse she designed for our Fair Ivy subscribers combines grey pinstripes and a white vegan leather in a subtle color palette that plays well with any outfit. 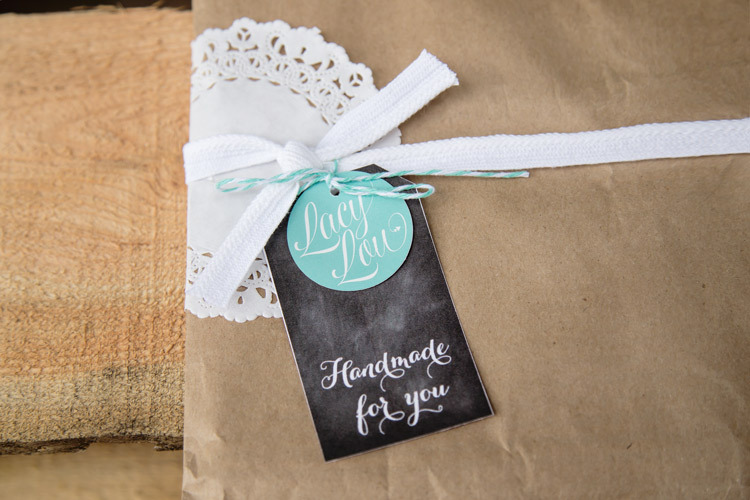 Every Fair Ivy item is handmade, vegan, hand wrapped and chosen specifically for our subscribers. This month’s Thyme gift box is no exception and Lacy Lou Designs has include one final touch to make it even more special. After all, the only thing better than unwrapping one gift is unwrapping two gifts. 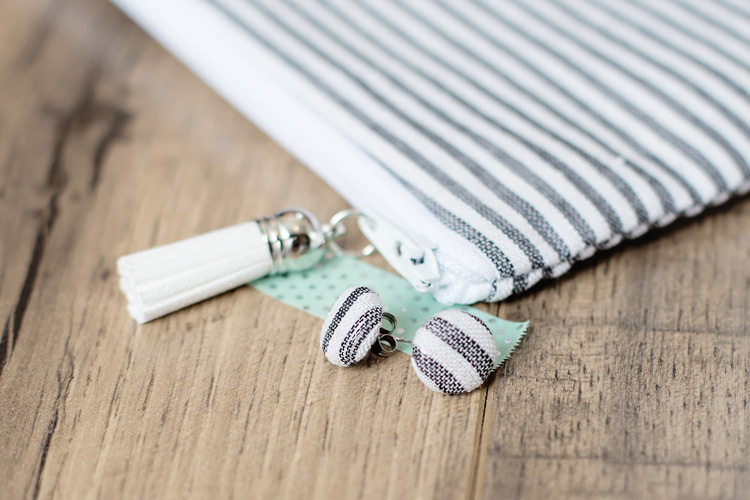 Tucked carefully inside each purse is a pair of button stud earrings, made of matching pinstripe fabric with a clasp backing. 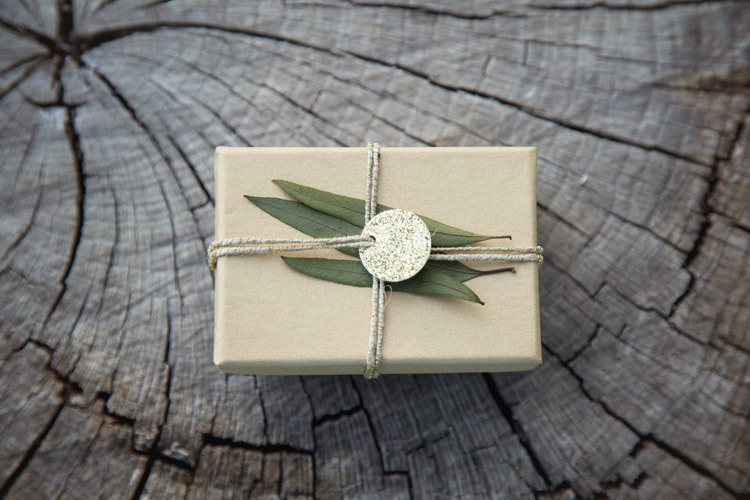 Our Rosemary subscribers are enjoying their monthly gift boxes and the gift this month comes from Susi D. Jewelry in Valencia, California. 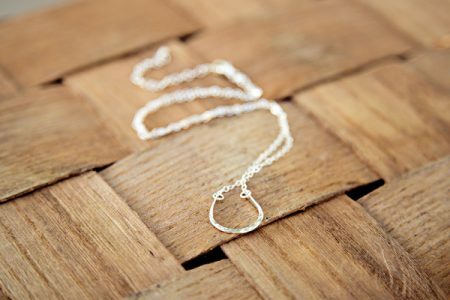 Handmade and wrapped by the artist herself, this silver horseshoe necklace is feminine and playful. 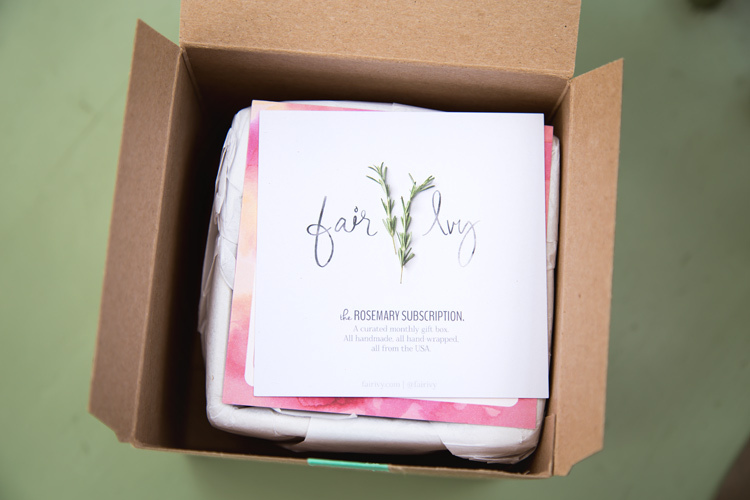 Keep reading to see the packaging and unwrapping of this month’s Rosemary subscription. Every monthly gift is handmade by artists, using vegan and cruelty free materials. 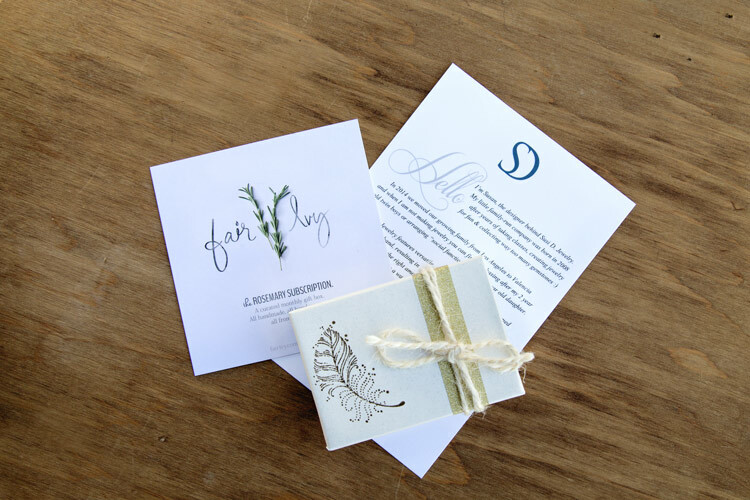 Inside each box, you’ll find a gift exclusively for Fair Ivy subscribers and an artist’s card that tells about the piece and the story behind it. Susan, the face behind Susi D. Jewelry, officially opened shop in 2008 but has been making jewelry for much longer. Inspired by the unexpected turns and the beauty in life, Susan’s jewelry is feminine and elegant, with unexpected details that add charm and playfulness. 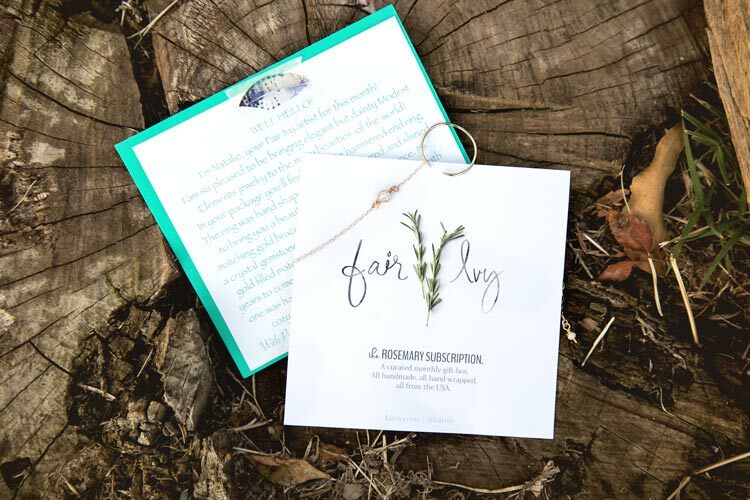 The necklace chosen for this month’s Rosemary box is hand formed and then hammered to add shimmer and reflection to the piece. 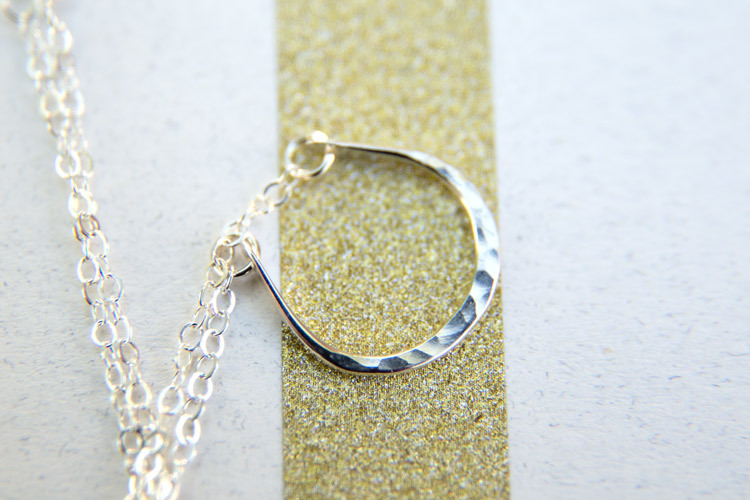 The classic horseshoe charm makes this piece timeless while the hammered texture adds a modern twist. Sitting close along the neckline, this horseshoe necklace can be layered with other pieces or worn alone. A closer look shows the surface texture of the horseshoe and the warmth and sparkle that it reflects. 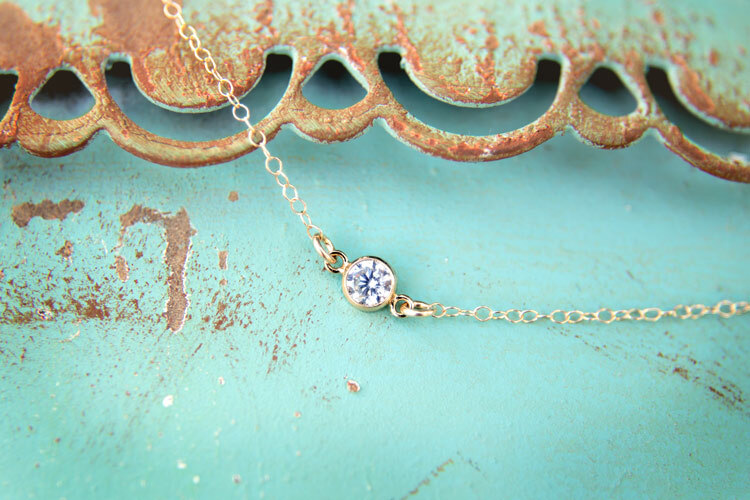 In addition to hand crafted necklaces, Susi D. Jewelry also offers bracelets, earrings and other pieces. Her work includes silver, gold and other metals and many of her pieces incorporate semiprecious gems. To see more and shop her store, visit Susan’s shop at www.susidjewelry.com. As a Fair Ivy subscriber, be sure to check the artist’s card for a special discount. 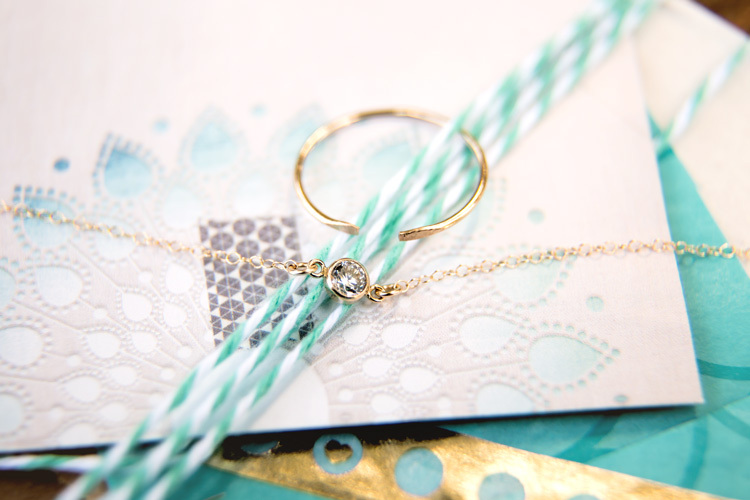 July’s gift subscription box is bringing something full of sparkle and fun to our Fair Ivy Thyme subscribers. 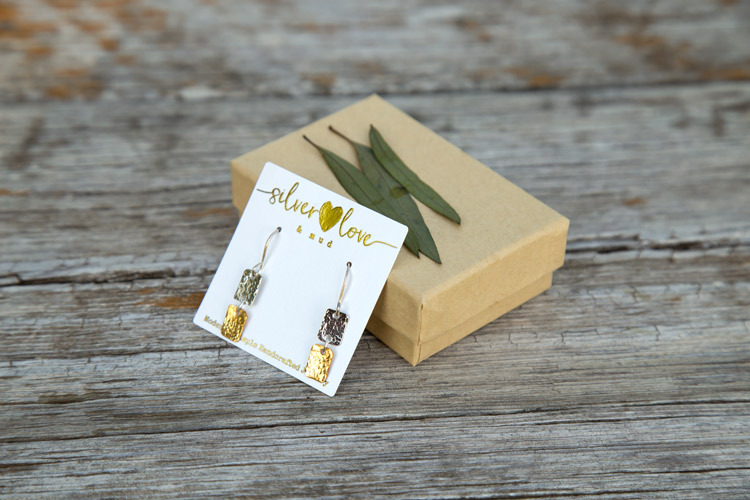 Not only does this surprise packaging mix shimmer with organics, it also keeps getting better with a handcrafted pair of mixed metal hammered square earrings – created to be modern and simple. 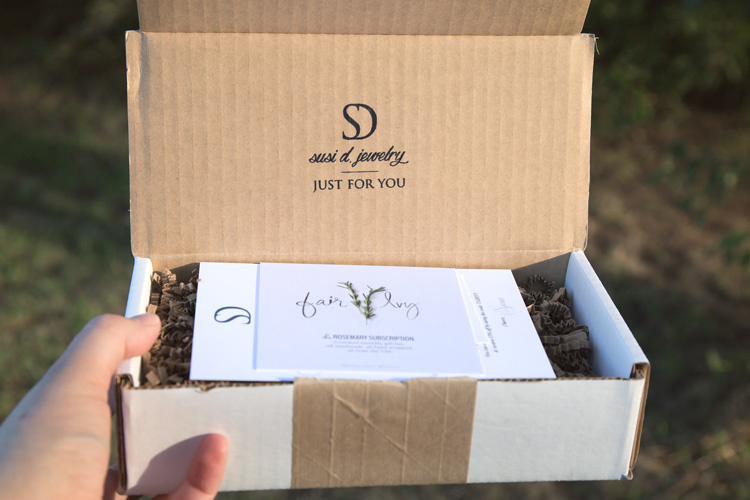 This month our Fair Ivy subscribers received a sweet little package from Natasha Justice of Silver Love and Mud in Loveland, Ohio. 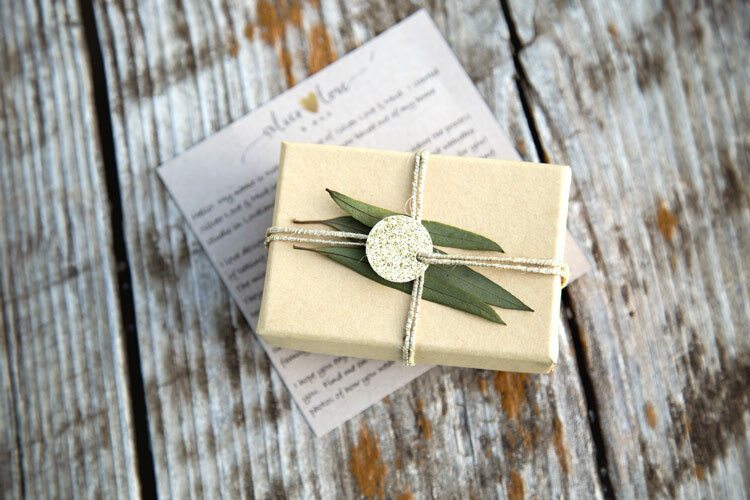 Hand wrapped in a craft paper box and decorated with gold threaded twine, hand punched gold spangles and bits of green foliage, this box is almost too pretty to open. 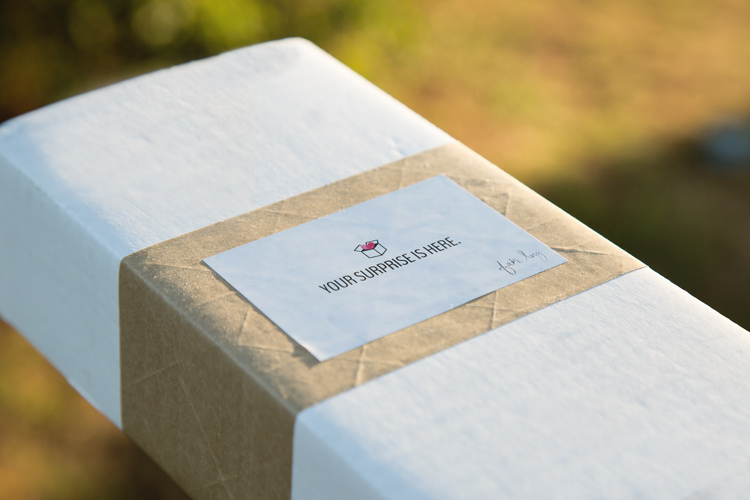 Luckily for you, we can’t wait to show off what is hidden inside this cute little package. 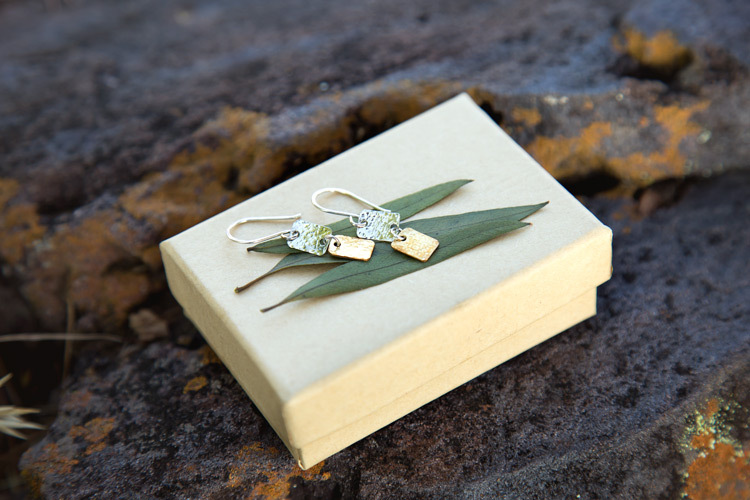 Nestled inside each box is a pair of mixed metal earrings, featuring a hammered texture and just a bit of length. 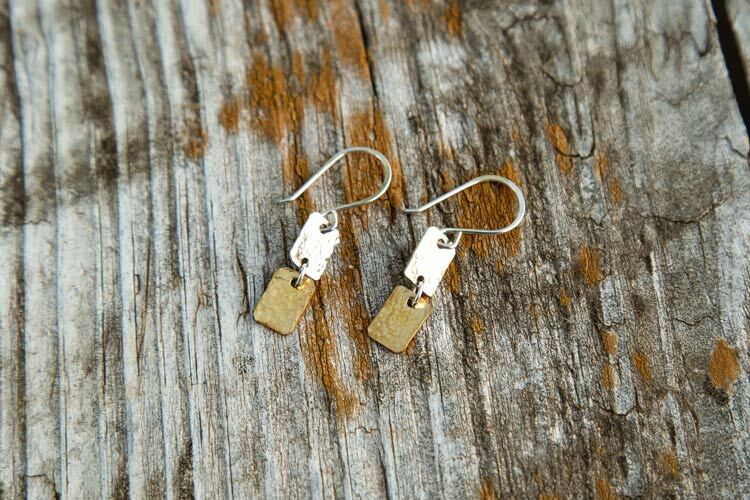 Created especially for Fair Ivy, these earrings have a French hook with the silver and golden squares suspended beneath. Great for a casual look, these modern earrings are lightweight and have just the right amount of shine. In addition to making metal and ceramic earrings, Natasha also designs ceramic dishes, necklaces and rings. 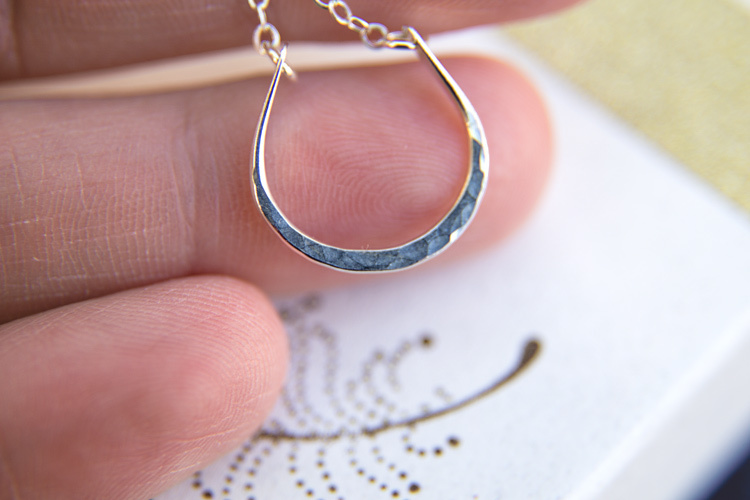 Her process uses basic smithing techniques to turn raw materials into simple, modern, every day pieces that are both beautiful and wearable. To shop for other items, visit her shop at Silverlove and Mud or look for her on Instagram @silverloveandmud. July brings warm weather and more surprises for our Rosemary subscribers. What busted out of their mailboxes? 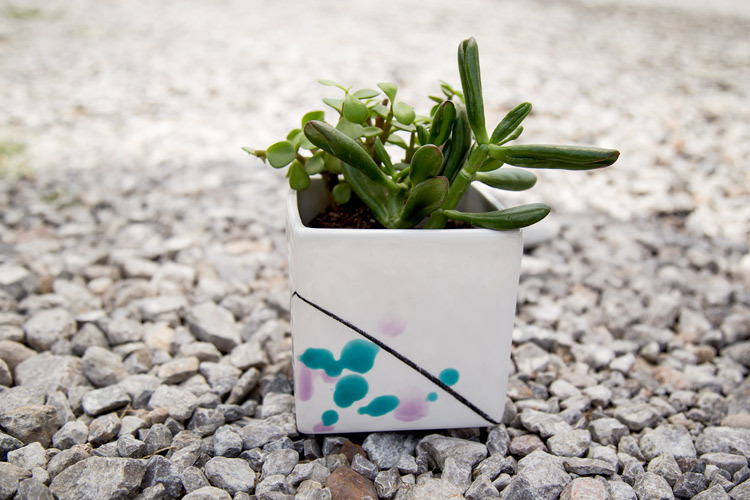 Handmade from start to finish, this small ceramic planter combines square lines, literally splashed with bold, summer colors. Scroll down to find out more. Fair Ivy is delighted to welcome back Amy from Redraven Studio this month and we are smitten with the ceramic planter she created for us. 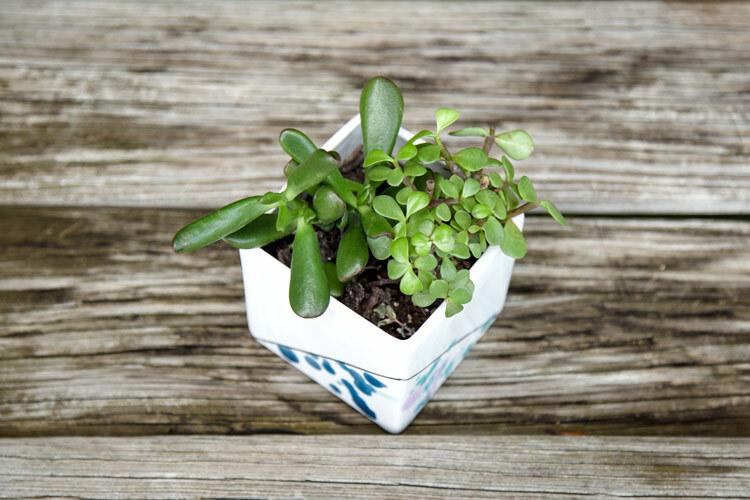 This little planter is the perfect size for a brightening up an entry table or adding some green to your countertop. Bright splashes of color are dabbled around the base and contrast nicely with crisp straight lines and square edges. 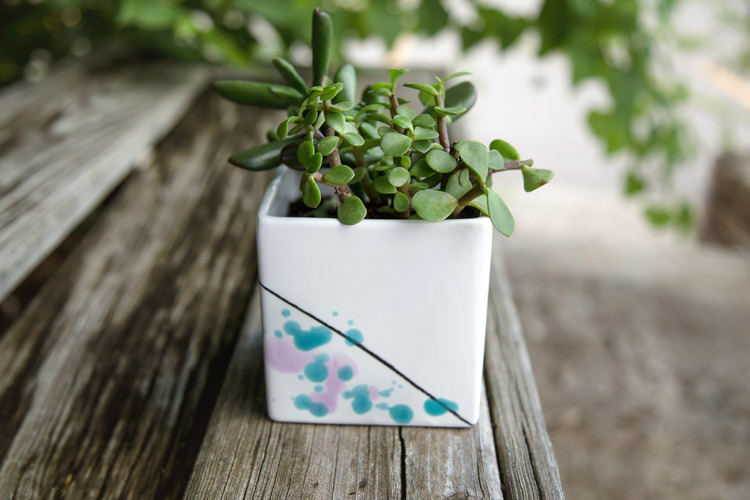 Created using a handmade mold, this porcelain planter has a solid bottom making it perfect for succulents or herbs. The simple lines compliment any decor and the bright pops of glaze add a bit of color. 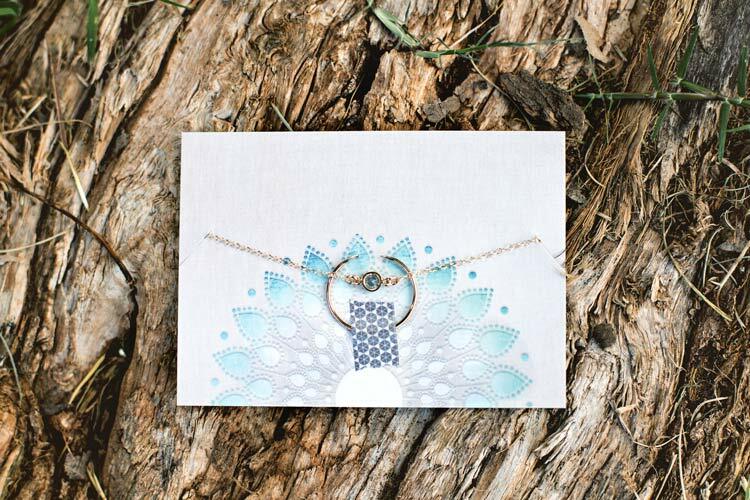 Redraven Studios is based in Berkeley, California where the artist Amy and her family live. Amy’s work is inspired by her explorations in the national parks and the natural beauty of northern California. To see more of her work, including planters, decor and dinnerware, visit Redraven Studios at www.redravenshop.com.